On this 8-hour tour, visit Niagara-on-the-Lake and Niagara Falls, and enjoy a ride on the Hornblower Niagara Cruise. This tour is geared for travelers who prefer a smaller more VIP tour, while still meeting other fellow passengers. You'll travel in a luxury vehicle with a licensed tour guide. 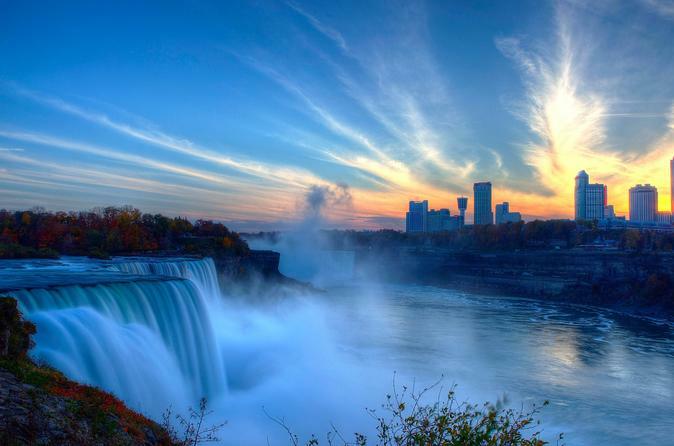 Dip your senses into Niagara Falls during an enriching guided sightseeing experience. Depart from Toronto early in the day with a personal pick up from most hotels and prepare to behold the beauty of a true North American treasure as your guide traces a southerly route toward Niagara Falls. Our charming, expert guides gracefully usher you into Niagara Falls, where you can witness the magnificence of North Americaâ€™s most powerful waterfalls. Your heart will soar when you catch sight of these wondrous falls, charging over a natural precipice and cascading into the vibrant blue-green waters that stream into Lake Ontario from aboard the Hornblower Niagara cruise. After this unforgettable ride, your guide will lead you the Table Rock complex where you will indulge in a three-course lunch with the closest unobstructed view of the Horseshoe falls while taking in local cuisine. Journey down the parkway leading into the lovely and quaint town Niagara-on-the-Lake with its impressive retail shops, cafes, and historical sights. Toast to an awe-inspired day with a visit to a Frank Lloyd Wright inspired winery with a unique tasting experience featuring ice wines found exclusively at this property.